The best kind of 1-year-old pit bull is a calm, well-behaved one. A 1-year-old female pit bull has the enthusiasm of any dog still dealing with puppy energy in an adult-sized body. With a terrier's exuberance and an athlete's stamina, a young bully girl needs an owner with the right information to direct her energy and help her mature into a calm companion. Burn off as much as possible of that 1-year-old energy every day. Walk, hike, bike, run and swim with these ready and willing partners. Have fun playing fetch, tossing flying disks and trying obstacle or agility courses. Invest in a strong nylon leash that should be 4 feet long or shorter, and a harness or training collar. 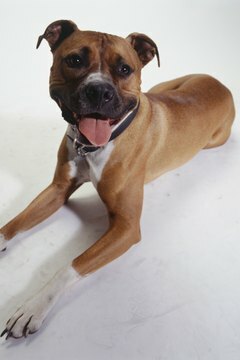 Train your dog during one-on-one training sessions to exercise your dog's mind and increase your bond. 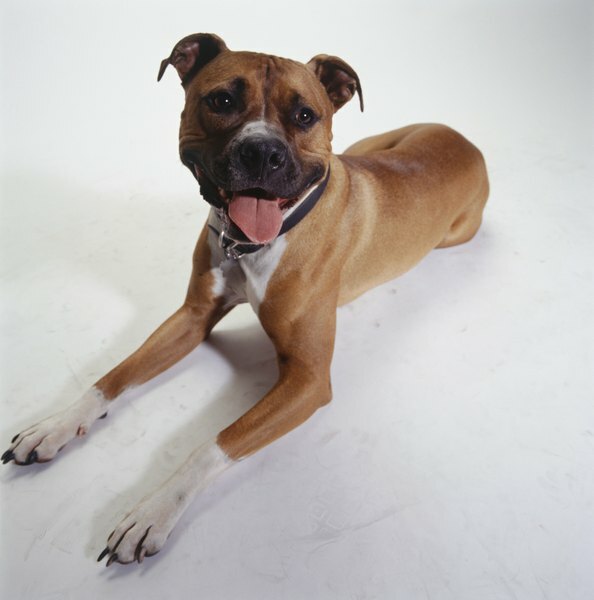 Start with basic commands like "sit," "stay" and "down." Reward positive behavior with small healthy treats or a clicker sound. Take training outside too, so your dog is focused in the presence of external stimuli. Take obedience classes to encourage focus when your 1-year-old is surrounded by groups of people and dogs. Try agility classes to work on attention span and the connection with your canine companion. Join pack walks to stimulate the dog socially, emotionally and physically. Give your 1-year-old put bull a job. Add a backpack during one walk a day so she expends more energy and stays focused on both the walk and keeping the weight distributed properly. Inside, teach her to find things around the house by giving her a scent to track. Sign up for agility, jump or disc trials, learn rally commands, try weight pulling or whatever competition suits your climate and energy levels. Strive for a more individual goal like qualifying for her Canine Good Citizen certification. Spay your 1-year-old pit bull girl for her health and safety, long and short term. Ensure she is physically ready for the activities you want her to try with a full veterinary examination, yearly shots, microchipping, heartworm preventative and flea and tick repellents. Take the lead by projecting authority, quiet confidence and strength, so she knows your expectations. Be in charge of the pack, and she will naturally fall in line. A dog secure in her home and pack will be able to relax and stay calm. Take time getting to know your female pit bull. Every dog is different, and not all suggestions apply to your dog and your situation. Work with a trainer or your veterinarian to make sure you are addressing your dog's needs safely and to get helpful input.